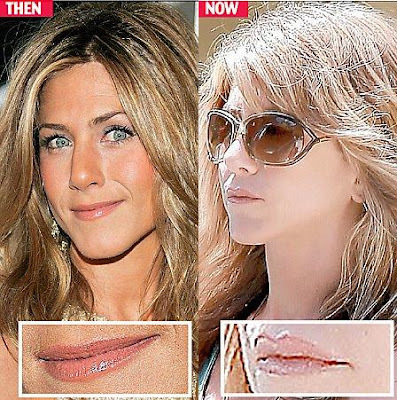 Has everyone's favorite friend, Jennifer Aniston, been dabbling in some unnecessary lip augmentation? I wish the answer was no, however from the looks of this before and after picture, lip injections seem to be on the menu for the beautiful celebrity actress. At least she hasn't went overboard and totally transformed herself, like we see so often. Stay tuned, folks. It looks natural, and not overboard. She's so cute, but she did lack a top lip. I wonder how she looks so good with all the tanning and smoking she does. Granted, she eats well and exercises a lot.